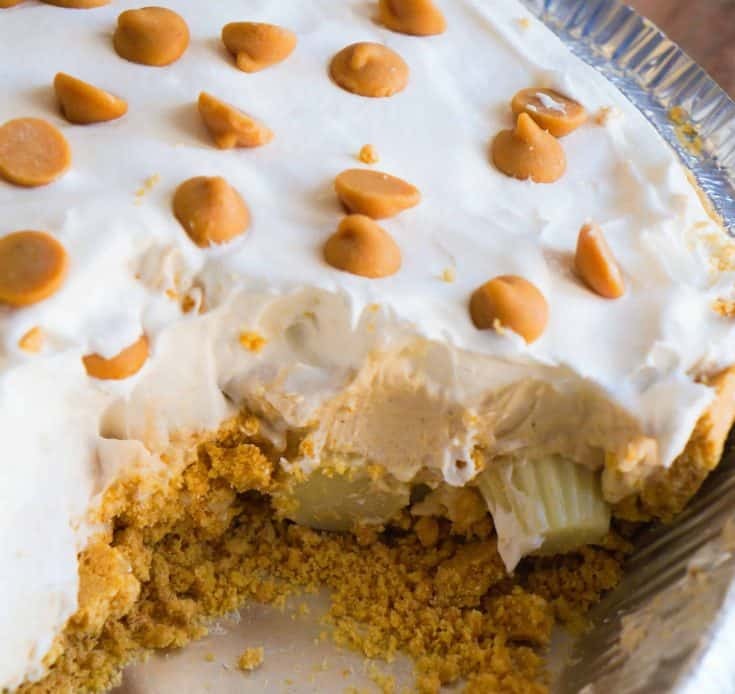 White Chocolate Peanut Butter Cup Pie is an easy no bake dessert recipe for peanut butter lovers. This pudding pie is made with a store bought graham cracker crust so that you don’t have to turn on the oven. Reese’s Peanut Butter Cups are one of my favourite treats and they’ve recently come out with mini white chocolate peanut butter cups so I had to give them a try. The white chocolate peanut butter cups are amazing so I needed to use them in a new dessert recipe. 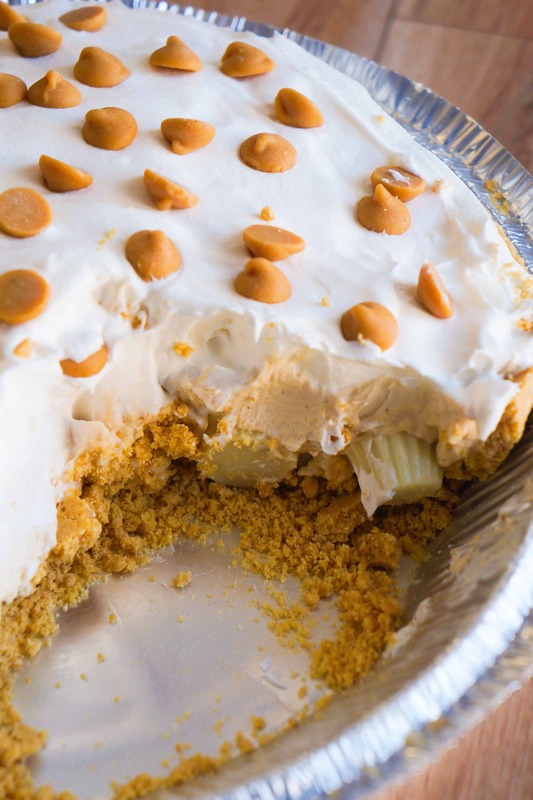 To make this white chocolate peanut butter pie I started by chopping all the mini peanut butter cups in half and then dumping them into the store bought graham cracker crust. I spread the peanut butter cups out evenly over the bottom of the pie crust. Then I whisked some instant white chocolate pudding mix with some milk until it thickened. I added peanut butter to the pudding and stirred. Then I folded in some cool whip before pouring the mixture into the pie crust over the white chocolate peanut butter cups. I topped the pie with the remaining cool whip and some Reese’s peanut butter chipits before covering it and placing it in the fridge. I allowed the no bake pie to chill for about two hours before slicing and serving it. 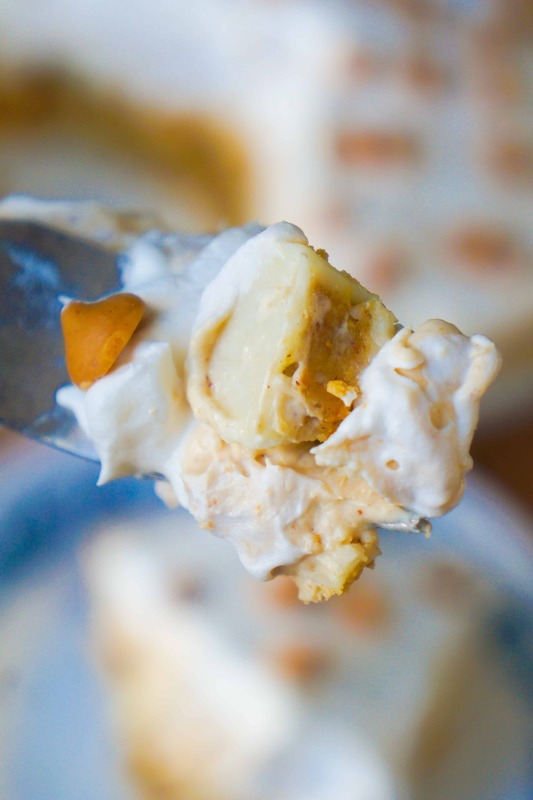 This delicious pie has the perfect balance of peanut butter and white chocolate. If you are a peanut butter cup lover you need to try this White Chocolate Peanut Butter Cup Pie. If you are looking for more easy dessert recipes check out No Bake Red Velvet Pie, Chocolate Chip Cookie Dough Pie, Caramel Chocolate Cream Cheese Stuffed Cookies, Peanut Butter Cookie S’mores Cups, Fritos Peanut Butter Cup Bark, Cinnamon Toast Crunch White Chocolate Bark, Peanut Butter Cookie Bars, Easy Peanut Butter Bars, Peanut Butter Cookie Dough Dip and Cookies and Cream Red Velvet Cookie Bars. 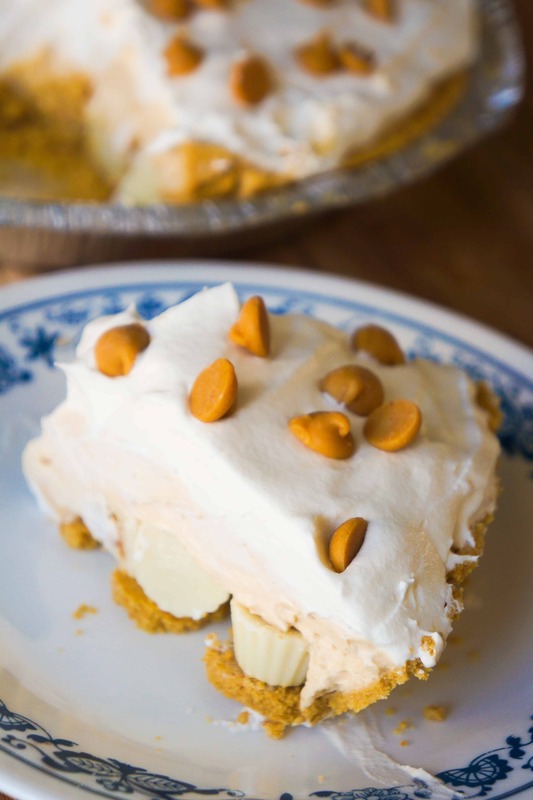 Another no bake peanut butter pie recipe. 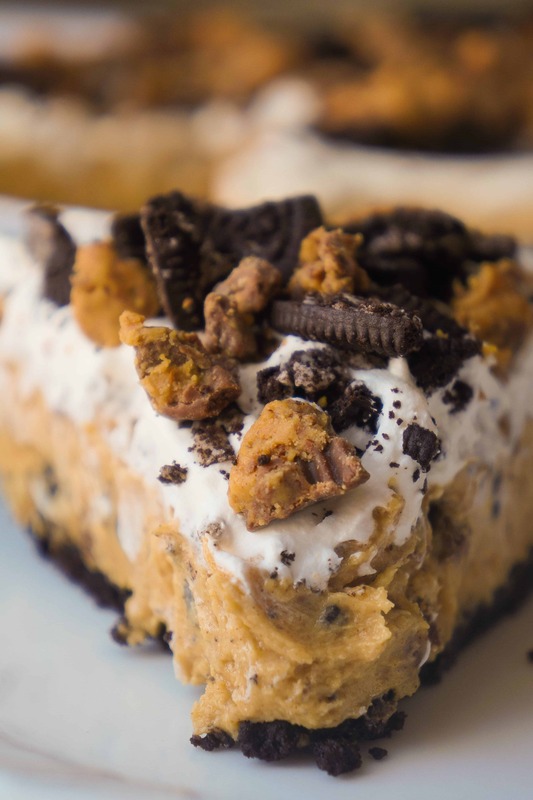 Be sure to try this No Bake Oreo Peanut Butter Cup Cheesecake! 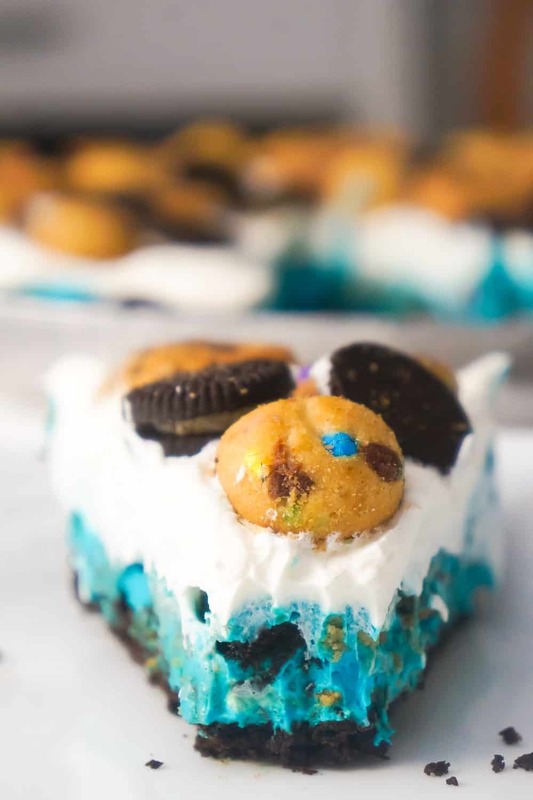 Be sure to also try this No Bake Cookie Monster Pie! 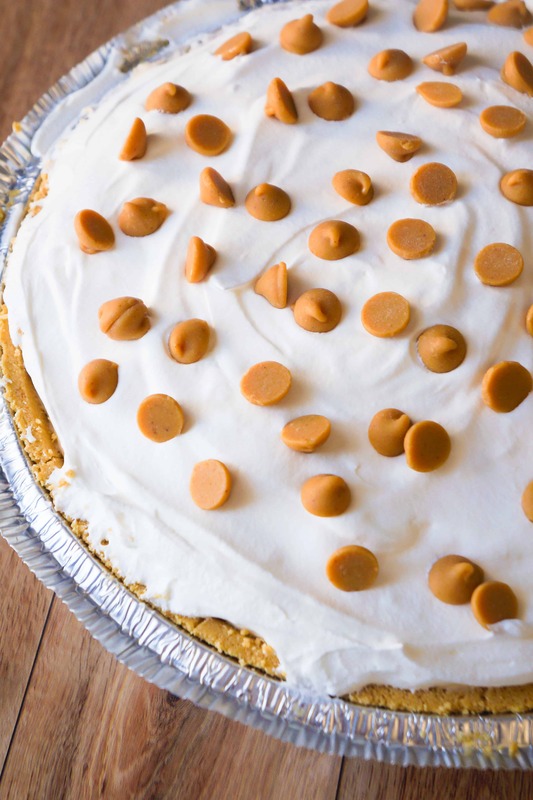 White Chocolate Peanut Butter Cup Pie is an easy no bake dessert recipe. A graham cracker crust is loaded with Reese's mini white chocolate peanut butter cups and white chocolate peanut butter pudding. In a medium mixing bowl whisk together the instant pudding mix and milk until it starts to thicken. Stir in the peanut butter until fully combined. Add half of the Cool Whip to the pudding mixture and stir. Cut all the of the mini peanut butter cups in half and then dump them into the pie crust. Spread the peanut butter cups out evenly to cover the bottom of the crust. Pour the pudding mixture over top of the peanut butter cups and spread it out evenly. Spread the remaining Cool Whip over the top of the pie and then sprinkle on the peanut butter chipits. Cover the pie and place it in the fridge for at least two hours before slicing and serving.